It was 2 hours until schooltime and I had a lot of juggling to do to pull off our first day of homeschool in the manner I had dreamed of for months and months. What in the world was I going to do with Baby Betsie? After months of eating every non-edible object in sight, she had started to become trustworthy again…only to learn how to climb. Nothing is safe from her reach now, and most of it still goes in her mouth after she scales the table to fetch it. And, most importantly…when would I find time to blog? (answer: well past my bedtime). But this was no time for second-guessing. We had much to accomplish, me and my Mister, and even if the day was kind to us and went by slowly, Gideon was too excited to be put off for long. With a 9:00 a.m. deadline, I bathed, I groomed, I drank my coffee, I read my Bible and prayed, I led the kids through their new schedule, I made the bed, I made breakfast, and, sending the children upstairs with Mr. Gore to tidy up their room, I put the last finishing touches to my wardrobe and to our schoolroom. Straightening the large round rug in the middle of the room with my toe, I looked at my domain, glistening and gleaming from the overhaul it had received earlier that week, the smell of crayons and chalk feeding my enthusiasm…. Throwing my heavy bathrobe over my clothes, I tightly cinched it with a sash and called for Mr. Gore and Gideon to come downstairs (while Miss Sunday was left to “baby-sit” Betsie in the Betsie-proofed nursery). “Okay, Gid! Go grab your backpack and put on some shoes.” I said. “Where am I going?” he asked, confused. “But I am at school!” he laughed. We went on to explain to Gideon that, after telling us goodbye, he needed to go out the back door, walk through the side yard, go to the front door and knock. Then he would be at school. His expression was priceless, and I knew that we had hit the jackpot with this idea. The novelty and fun of this adventure resonated so deeply with our little 5-year old boy. He hugged me back, his smile of wonder now a permanent fixture on his face, and Mr. Gore and I waved at him as he began his solitary walk to his first day of school. I shut the door, the old-fashioned shop bell we bought at Victorian Trading Co. jangling above me. 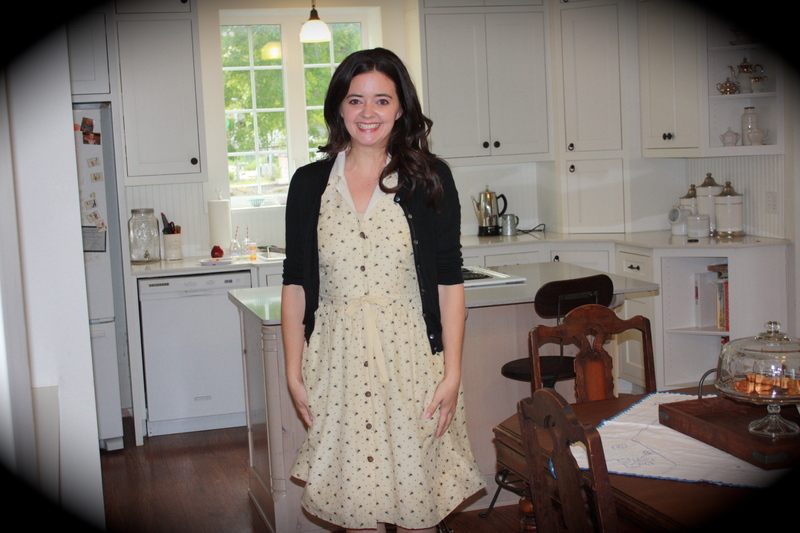 I untied my robe and dropped it, revealing the “teacher” dress I had ironed the night before, an Anthropologie gem my Mom had bought for me last Spring with a little bumblebee print, topped with a black cotton cardigan. Slipping on my t-strap wedges, I ran on tipey-toes through the kitchen, letting down my hair as I ran. I couldn’t stop giggling and suspected that I was smiling like a 5-year old at Christmastime (yikes…I was right). Mr. Gore and I followed Gideon’s progress by the office (schoolroom) windows, and within seconds, I saw his shadow pass by the living room window, followed by a little knock. Mr. Gore got into position with the video camera, this time facing the front door rather than the back. “How did you DO that? !” he asked in awe. “But this is my home!” he laughed. “Nope. 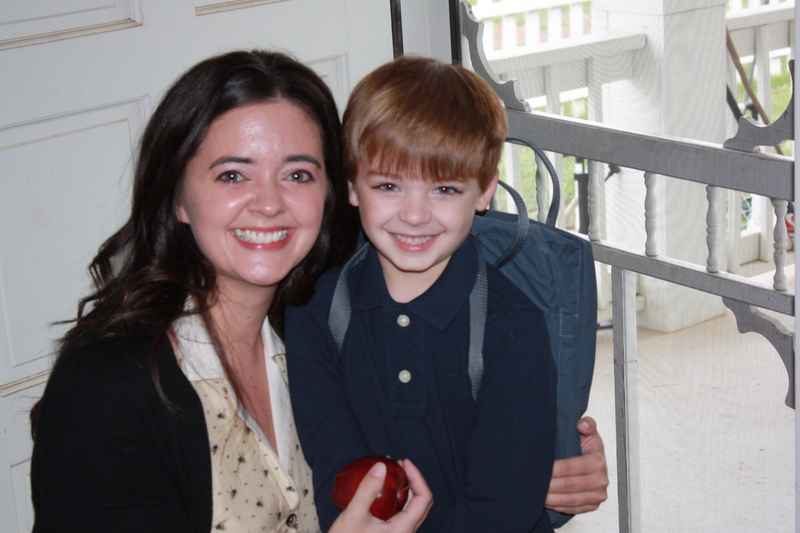 This is school now…” I said, my smile matching his as I scrubbed his hair and touched his little face once more. I was dying to scoop him up and hug the living daylights out of him. “This is for you!” he said, holding out his apple. Laughing, I accepted it, sealing this new phase of our relationship with the most timeless token of scholarly affection known to teachers. 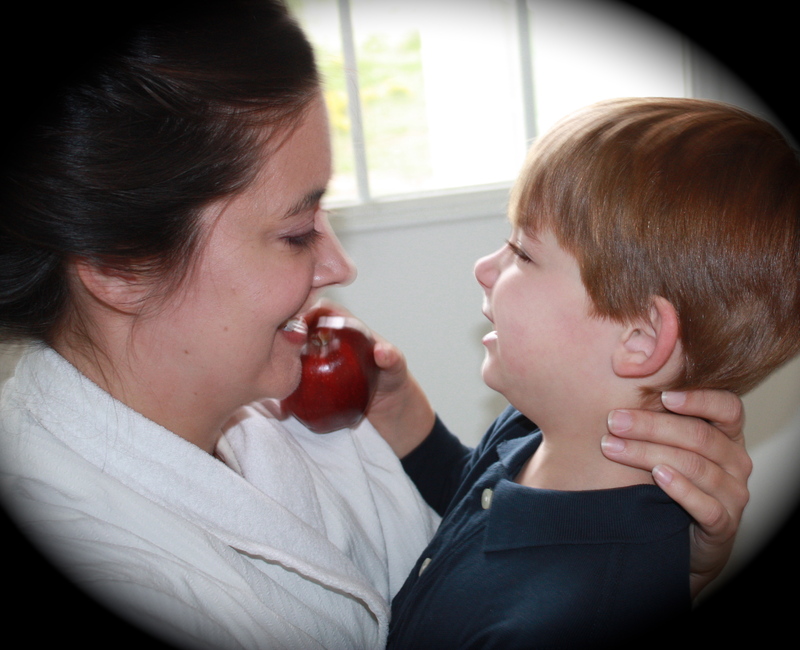 We posed for a school picture, my student and me, our first of hopefully many. Whether the sheen of tears in my eyes is from laughter or sentimentality, I’m not sure…but probably both. and with that, our Home Academy was finally in session. Gid was hilarious today and somehow managed to be the class clown in a class of ONE. Public Schools…you should thank me for keeping this one at home. we’re going to do just fine. You have no idea what an encouragement you are to me! 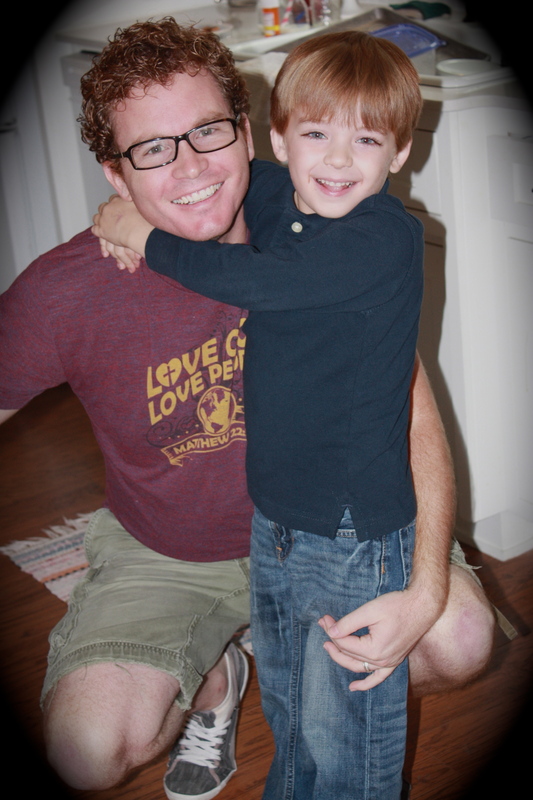 I am also starting on this new adventure of Homeschool with my 5 yr. old son. You are so relate-able and eloquent in your stories! Thank you!!!! Mrs. Gore, I LOVE reading your posts, blogs and anything else you “put out there” for the public to see. YOU ARE TRULY AMAZING! I also get the hint of tears in my eyes as I read.You write with all the passion you portray in being a mother. I am blessed because I know you and have watched you become the person you are today. I LOVE YOU! This post made me cry. SOOOOO sweet! I just found your blog after a friend posted a recent blog of yours on fb. I, too, started homeschooling this year. My oldest is in kindergarten. I also have a 4 year old and 9 month old so I find your blog very relateable! This posting mad me cry! I’m so looking forward to following your blogs! Mrs. Gore, tomorrow I start homeschooling my daughter and I have loved this “go out the back door, come in the front door” transformation idea since I first read in nearly 2 years ago. I can’t wait to experience our own first day! Thank you for your inspiration and encouragement!